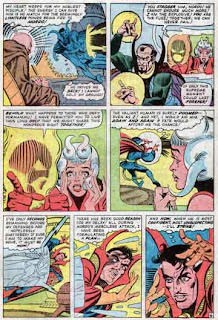 that story about the 2 lost Dr Strange tales is so tantalising.I hope Ditko changes his mind one day . . . .
carl - I used to hang out with ron lim before breaking in, and had the chance back in the day to hang with you as well. Never got to work with you however! and put my own little story about sturdy steve up there as well. nothing too special, just a little memory. "By the time he left Marvel, Ditko had stopped giving interviews, signing autographs or attending comics conventions." I'm not sure, but I don't think he EVER did those things, before or after. I know he gave one interview with what amounted to one-word answers, and he refused to work on a "Merry Marvel Marching Society" record that the rest of the Marvel Bullpen pitched in on, obviously while he was still at Marvel during that first tenure. As you probably know, Steve's a private guy, and was, at least from what I've seen, always like that, regardless of where he was with Marvel or Objectivism. Which is a shame, because if he was a bit more exposed, we might not have so many people believing that Alan Greenspan is anywhere close to an "Objectivist." I remember writing a fan letter to him over 10 years ago and I mailed it to what I thought was his home. It was, in fact, his publisher's home, Robyn Snider, and it was returned to me by the post office. Refusing to quit yet almost pushing my luck, I mailed a note to Robyn directly (with my initial fan letter attached), politely asking if he would be so kind as to forward my original fan letter to Ditko. I was away for that weekend attending a convention in Orlando, Florida (I lived in New Orleans at the time), portfolio in hand and coming home feeling very weird about the Con. I was 19 and I was kinda depressed about the entire experience. I forgot about all of that as soon as I opened my mailbox and found a thick envelope from Steve Ditko! It was not a traditionally supportive letter full of advice and encouragement to a young wannabe; it was a harsh, unfiltered, and unapologetic 5 page handwritten letter about the comics industry, philosophy, and Art. Although initially taken aback, I have learned and grown tremendously from that and the other letters we've written to each other over the last 10 years. Before I sign off, I have to tell you that I've always admired and respected your comics work. As a kid collecting comics, you were one of the first creators I noticed that did it all. The fact that you were involved in most aspects of comic creating left an impression on me. For better or worse, I've since aspired to do that very thing. That type of control is, in my opinion, the very thing that makes comics exciting to me. It sounds like you had a great relationship with him. Thanks for the post and for the memories (I looked back into your archives and the Halloween photos were great!). I look forward to more. Good call on Duchovny - I will never look at him the same way again! I've always thought David Niven looked a lot like a Ditko drawing come to life, especially with those crows feet around his eyes! This is very interesting to read. I've always been a Ditko fan (by way of Spider-Man, of course), and back in "the good old days" I received a Marvel trading card signed by Ditko (and later collected a few signed by Stan Lee and one by Jack Kirby, to complete the triumvirate).